Prospecting is like picking up rocks, the majority of them are worthless, a few downright dangerous because they have snakes, scorpions and spiders under them, but there will be those few that are priceless diamonds that fill your bank account with “unlimited wealth for a lifetime” The benefits and results of a lifetime commitment to effective daily marketing is a “unlimited wealth for a lifetime”. Prospecting is a 3 step process; Pick Up, Inspect, Keep or Toss”. Prospecting is not about you getting rejected by people, it’s about you rejecting people. Your marketing system has to be one where every No is an intentional response and result of you First rejecting them as a client. In a comical aspect it would be like looking for only those who have a brain and people jumping up and saying, “Don’t Choose Me, I Don’t Have One!” Every No is just like that, and when you view it as such the pain of No’s is not that painful. Our “Painless Prospecting” and Painless Selling” marketing system only attracts those who I can help and benefit and that are ready to buy while simultaneously flushing out and rejecting those I can’t. Here are the three main components to double and tripe your income. Here is how we use these components in our company. Our right audience is the right individuals that have been attracted to us and flushed out the wrong ones with our Painless Prospecting and Painless Selling system. Our message is we take the Pain out of Prospecting and Selling as you grow rich. Our system to attract the right customer, reject the wrong one and do it fast, easy and painlessly is by giving away our e-book we co-author with International leaders. I share this secret ingredient on a CD that I make available to all our Exclusive Inner Circle Members. If you have not signed up to our Free Inner Circle Membership yet, do so today at http://www.DonBoyerAuthor.com while enrollment is still open. In closing, as you prospect just remember, some rocks you keep, most you reject and a few will make you wealthy for a lifetime so keep on prospecting those rocks! See you tomorrow, and keep sharing us with your friends. We all have or had friends in the past that cost us money; some of them lose us money and a few of them that actually make us money. My goal is to make everyone associated with me money. I want to be a constant source of income for all those I have any type of relationship with. The key to business prosperity is to surround yourself with the best of friends that add value to your life and you in return add value to theirs. As far as prospecting goes, I been sharing with you the method I use called “Painless Prospecting”. It is the easiest; most effective, productive and profitable form of turning absolute strangers into loyal paying clients. That system once again, is simply giving away an e-book that you co-authored with top International leaders to your target market. The inner ingredients that make this system work is the “credibility factor” of being associated with top leaders, this automatically separates you from every one of your competitors. It gives you the “profitable positioning” of being an expert that gives you the edge of why future clients will chose and hire you over others and it allows you to stand out in the marketplace. 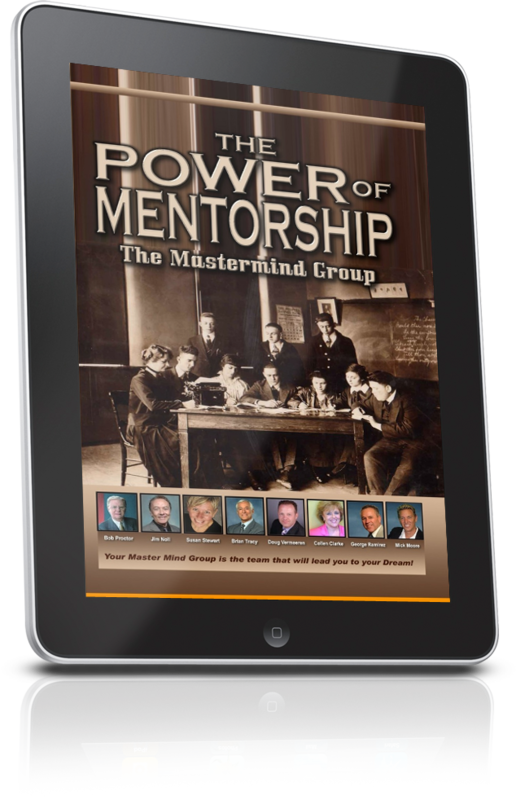 Not many people can get you into a book with International leaders like Bob Proctor, Brian Tracy, Les Brown, the late and legendary Jim Rhon and Zig Ziglar but I can. But here is the most important thing I can do for you that no one else can…I teach you the system of “Painless Prospecting” and “Painless Selling” using your book. No matter what prospecting system you use, remember prospecting is your best friend and will lead you to unlimited riches and wealth. Make prospecting your best friend, never abandon it, use it daily and you will never have to worry about money again. Selling, if you are using our system of “Painless Selling” it is a simple process of providing your service to those who are ready to buy. It does not get any easier than that. My entire day and company works with those who contact us because they are ready to buy. There is no pushing, begging, convincing, outwitting objections, and long frustrations. They are just wonderful smooth transactions that are a pleasant win-win for all parties. However, this type of client does not pop up out of the blue by accident. No, no, this type of client is a Direct Result of using my system of “Painless Prospecting”. What would it be like if everyday all you dealt with was people who contacted you and wanted to buy what you had to offer? This is no fantasy or green genie smoke being blown up your Kazoo, this is actual reality of the most successful people in the business world today. Remember, selling can get you out of a financial jam, it can provide you with the best that life has to offer and it will be a continual source of income that streams into your bank account. Yes, selling is truly your best friend. Ok, I have shared with you how simple it is to double and triple your income this year with “Painless Prospecting” and “Painless Selling”. Nothing is easier and more effective than this system. But there is one ingredient that must be applied to make this or any system work and that would be your 3rd Best Friend…Hard Work. Hard Work is the ingredient that makes every system on earth work. Zig Ziglar once asked his dentist; “Do I have to floss all my teeth”? His dentist answered, “Heavens No, just the ones you want to keep!” My friend Les Brown says; “When you stop fighting for what you want, what you don’t want automatically takes over”. There are no short cuts to hard work, no getting around it, no avoiding it and the sooner we accept that the easier it will be for us to see the value of hard work and realize it truly is our best friend. If you make Prospecting, Selling and Hard Work your 3 Best Friends your money, cash flow and business troubles will disappear like vapor. Yesterday I shared with you a secret that every top platform speaker and professional salesperson uses and it’s called “Putting Money in Peoples Pockets and then Set in on Fire”. In our Millionaire Speakers boot camp I teach this in detail and it will lead you to a six figure income guaranteed. Since my next Millionaire Speakers Boot Camp is not until June, and you cannot wait that long to double and triple your income here is how I can help you. You can learn this entire six figure income system in our Millionaire Speakers Home Study Course. This is the same course that 99 percent of all those who attended our boot camp at the price of $2500.00 buys at the end of the week end for $995.00. And they love it, but don’t take my word for it, watch the video testimonials on our website at www.DonBoyerAuthor.com. As always, thank you for reading our post, my goal is to help you thrive in your business and make more money than you ever dreamed possible. Don’t forget to share our daily post with all your contacts….”Gracias” (Thank You). Ps. For those who have the wisdom to invest in themselves with this program at this insane price, I am going to invest in you by throwing in our Million Dollar Marketing program for free. This alone is a $500.00 value. I teach this Million Dollar Marketing course in our boot camps.